Editor's note: Although these photographs of Hawkwind are not up to our usual standard, we believe that they still have value as an honest representation of the actual performance. Hawkwind is one of the oldest, and certainly one of the most uncompromising, bands in the entire history of British rock'n'roll. 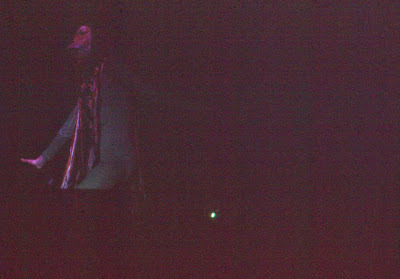 Although Hawkwind has never been able to achieve the same degree of worldwide fame as other bands of their generation, they nevertheless continue to be held in great esteem by their longtime fans, and their dogged eccentricity has caused them to be generally regarded as a musical institution in the United Kingdom. Hawkwind formed in Notting Hill, London, in 1969, with Dave Brock as guitarist and leader. Their first album, Hawkwind, was released on Liberty Records in 1970, with In Search of Space following in 1971, Doremi Fasol Latido in 1972, and Space Ritual in 1973. In the four decades since Hawkwind started, Dave Brock has remained the only constant member, with a number of other musicians passing through the band. The distinctive songs of Hawkwind, built on a foundation of repeated chords, electronic sounds, and murky lyrics, have always set the band apart. 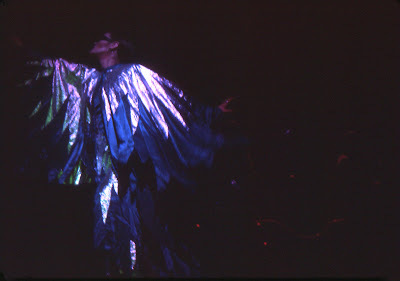 In 1974, at Zellerbach Hall in Berkeley, Hawkwind appeared with Man at a benefit for Dr. Timothy Leary, who was languishing within the walls of a penal facility at that time. 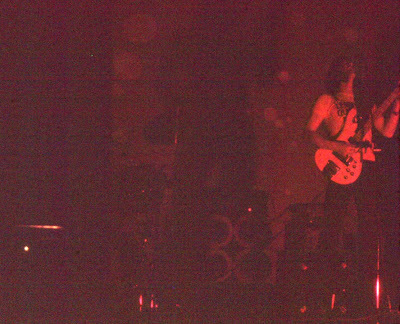 Playing a concert on behalf of Dr. Leary, who was well-known as the high priest of the psychedelic culture, was quite appropriate for the members of Hawkwind, whose mind-altering music, combined with their informal lifestyle, strongly reflected their wholehearted devotion to the psychedelic mindset. For a few hours that evening, it was as if the 1960s had never ended. 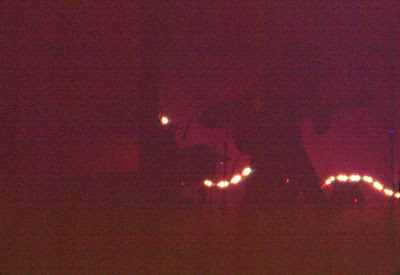 At Zellerbach Hall, Hawkwind included Dave Brock on guitar and vocals, Nik Turner (wearing a strange outfit that made him look as if he had just arrived from another planet) on saxophone and flute, Del Dettmar on keyboards, Simon House on keyboards and violin, Lemmy (who later formed his own band, Motorhead) on bass and vocals, and Simon King on drums. This lineup released an album, Hall of the Mountain Grill, in September of 1974. 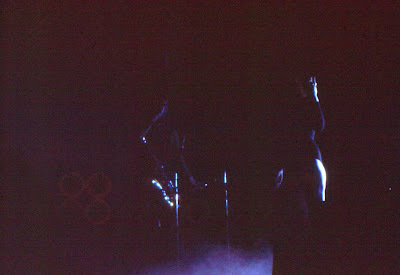 Appearing with Hawkwind was Stacia, a young woman of impressive proportions who danced wildly across the stage while Hawkwind played. In those days, a performance by Hawkwind was a truly awesome experience: extremely loud, extremely intense, and extremely forceful, conveying a dizzy feeling of hallucinogenic communion. Hawkwind's music was dense and relentless, with a heavy approach that hammered the helpless audience into a state of happy confusion. The overall effect, enhanced by the unusual lighting and the free-form motions of Stacia, was thoroughly overwhelming. 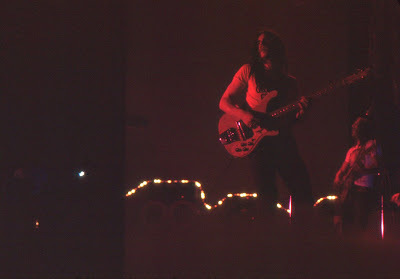 David: At Winterland we would arrive at 6 AM for concerts. We decided to show up early at Zellerbach Hall, but not that early. 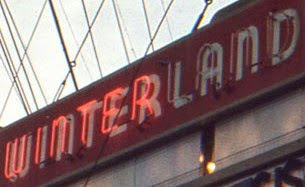 Unlike Winterland, others were not lining up, so we were free to wander. Being on the Berkeley campus and near the hustle of Telegraph Avenue made for a lot of people around. We walked over to Telegraph for a while and happened to see members of Hawkwind walking down the avenue. I didn't know exactly what they looked like, but they stood out even in that crowd. Their hair and their colorful clothes didn't match the scruffy look of the locals. Later, while waiting near the front of Zellerbach, a very striking woman in a red dress walked past us. We couldn't help but notice her, but it was Michael who recognized her as Stacia. I knew almost nothing about Hawkwind. I was there to see Man. 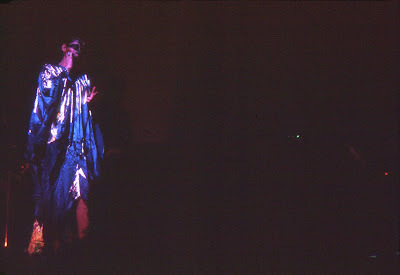 Michael explained that Stacia performed in pantomime during the show, which intrigued me. Being unfamiliar with the music and live performance of Hawkwind left me unprepared for what we saw and heard. It was like crash-landing on Jupiter, with no reference to time or place. 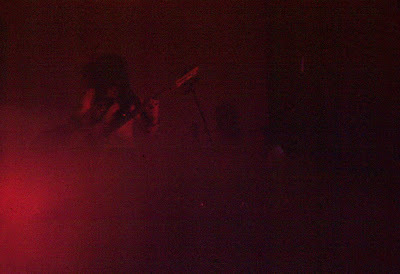 The stage was filled with fog and was mainly lit with strobe lights. Taking photos under those conditions was almost a useless endeavor. The photos that I did take came out very dark and had to be overexposed to reveal anything at all. 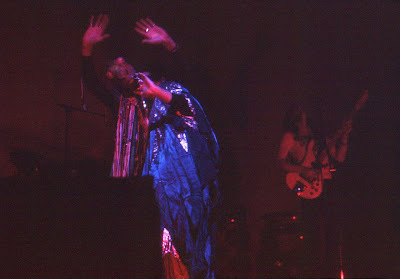 As bad as these photos are, I think they capture what a live performance by Hawkwind was like. Michael was right about the woman we had seen earlier. That was Stacia. 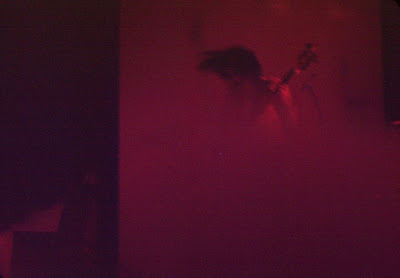 She moved around on the stage in a shiny cape. I remember at one point she stood there and pretended to mix potions in beakers, like a mad scientist or a space witch, and then pretended to drink it. 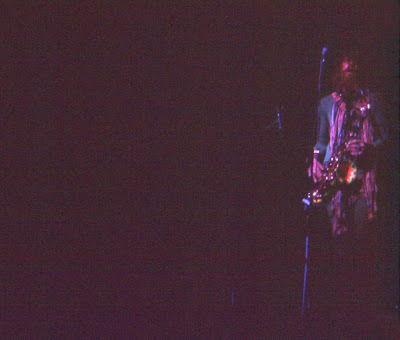 Nik Turner danced out in a frog costume, playing a flute. The two of them moved around each other in the fog, as the music blasted on. 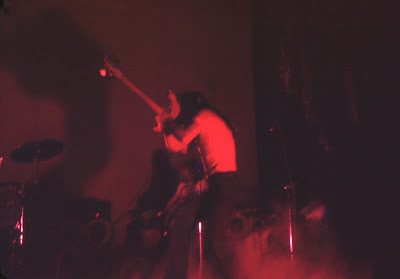 The strobe lights created a jumpy action that gave the performance an animated look. I wasn't sure what to think about the show at the time, and many years later I am still a bit perplexed. The closest thing I could compare it to was the Pink Floyd concert that I saw at Winterland in 1972. Hawkwind and Pink Floyd both created an eerie, out of this world, experience with powerful music and visuals. After the concert we met members of the band and got their autographs. I particularly remember meeting Nik Turner, who was very friendly. He seemed, to us, to be on drugs. His autograph was readable, but we could not decipher the short inscription that he left on each of our scraps of paper. Michael finally worked it out. Nik had written after his name, "Stay High!" I believe he was a man of his word. 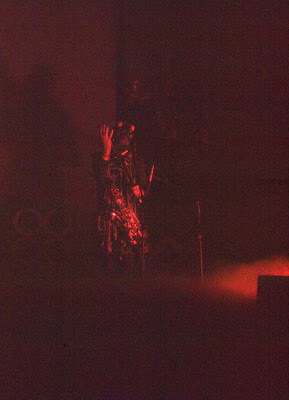 Gary: I remember being alerted by Michael and David, and seeing members of Hawkwind walking toward Telegraph Avenue near Zellerbach Hall. They were pale, long-haired men who stood out from the tanned UC dormitory dwellers. Later, we met them and got a few autographs. I remember getting two autographs that were almost identical, each of them saying, "All the best, Simon a;lkjdsg;lkj." (One was from Simon King and the other was from Simon House.) No one thought it was funny but me. Lemmy's autograph had a bold "Be of Good Cheer," and Nik Turner's was a frantic scrawl. They were ahead of their time with their link to science fiction and the overall conception of their music. Groups like Tangerine Dream and Kraftwerk took things further with synthesizers, but I think Hawkwind did it first. It was a great concert and especially rare, not being a Bill Graham presentation. An underground tour. Michael: No question about it, Hawkwind totally blew my young mind. Their performance at Zellerbach Hall was unforgettably astounding. Although I was not a user of drugs, I found that after Hawkwind had been playing for fifteen or twenty minutes, the force of their music caused me to lose my connection with the framework of time. It seemed that Hawkwind had been performing for hours and hours and hours. After the show, we waited at the stage door. When Lemmy came out, he graciously gave us autographs, behaving in an amiable manner that belied his rough appearance, and then told us that we were free to go backstage, where the other musicians were hanging out and the roadies were packing up the gear. When we approached Nik Turner, it was abundantly clear that he was still flying high. I wonder if he ever came down to earth? Nice review and interesting pics. Thanks a lot for sharing them. Wow, that makes great reading, and thanx for posting the pix! 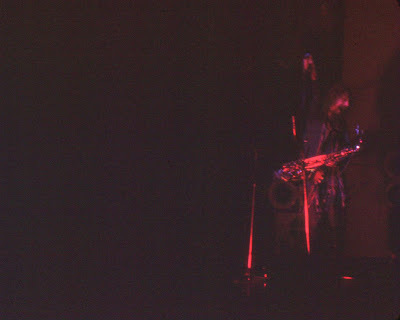 Thanks......pictures of Hawkwind from the early 70s are rare and even though they are dark, there are some great shots. Also your memories of the concert are quite clear, which is also rare, perhaps because you didnt take drugs which was also rare at a 70s Hawkwind gig. Fantastic reviews guys and great to see some pics of that early era! I bet it was a awesome gig!!! 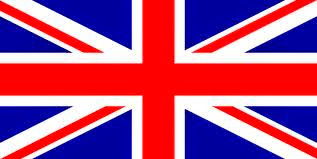 Thanks for your recollections. I saw them for the first time only two years later but by then they were a different band and a different experience. do you guys have an email address please. I worked for SUPERB and distributed the posters and performed other set up work for this show. I wish I still had one of the posters. It was crazy wild! Fantastic show! I thought the suit was a dinosaur.